Ointment Manufacturing Plant is ideal tools for the pharmaceutical / Food / Healthcare industry for the production of Ointment, Cream, Lotion, Paste etc. 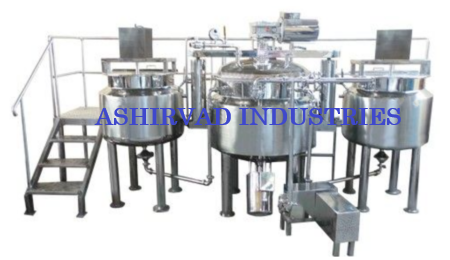 Ashirvad Industries offers Ointment / Cream / Paste / Lotion Manufacturing Plants capacity ranges from 50 Kgs. to 1000 Kgs. One pump required to transfer the material from storage vessel to the hopper of Ointment Filling M/c. Working platform made out of S.S. 304 Materials top of the platform will be Dimped Pointed Sheet for the safe movement of the operator. Platform will be provided with one staircase Railing made of SS304 will be provided at the border of the platform for safety.